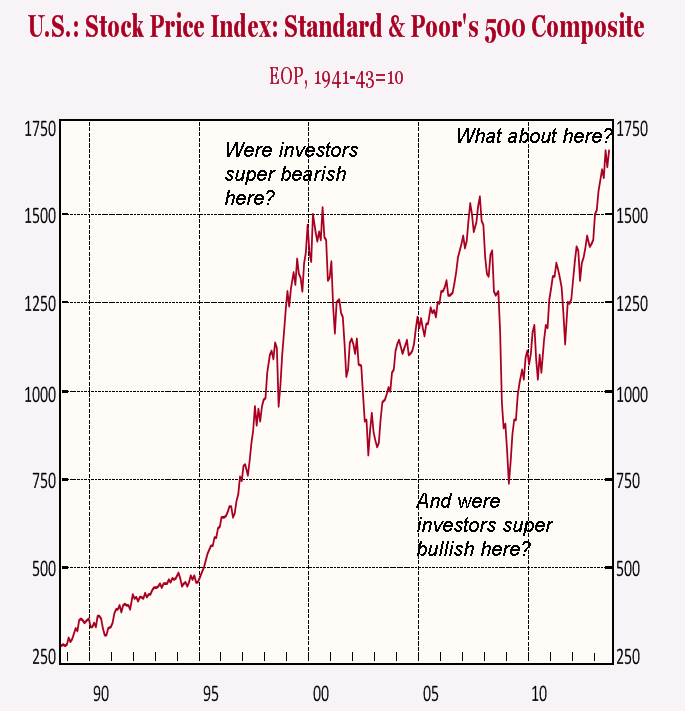 "The Fed has boxed itself into a position where there is no exit strategy." Delving further into the details we can see how this artificial rate environment is creating a blinding effect on investors everywhere. Nestle recently issued a 4 year bond at 0.75%, an all-time record low yield for a corporate bond. Historically, corporate bond yields have ranged in the 4% to 10% range. Imagine if that bond issuance came in at a bid of 5%. What would that do for the profit projection over the next four years for Nestle? Instead of paying 5% (cutting into to profits) to grow their global organization they are essentially getting free money! 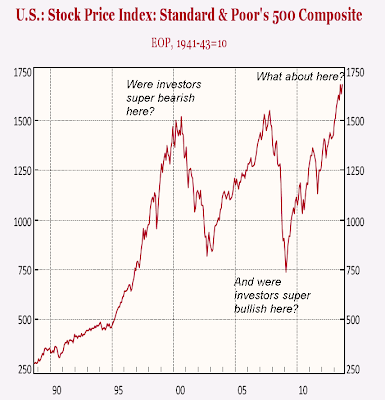 This is what the stock market has priced in. Free money always being available to send corporate profits higher. 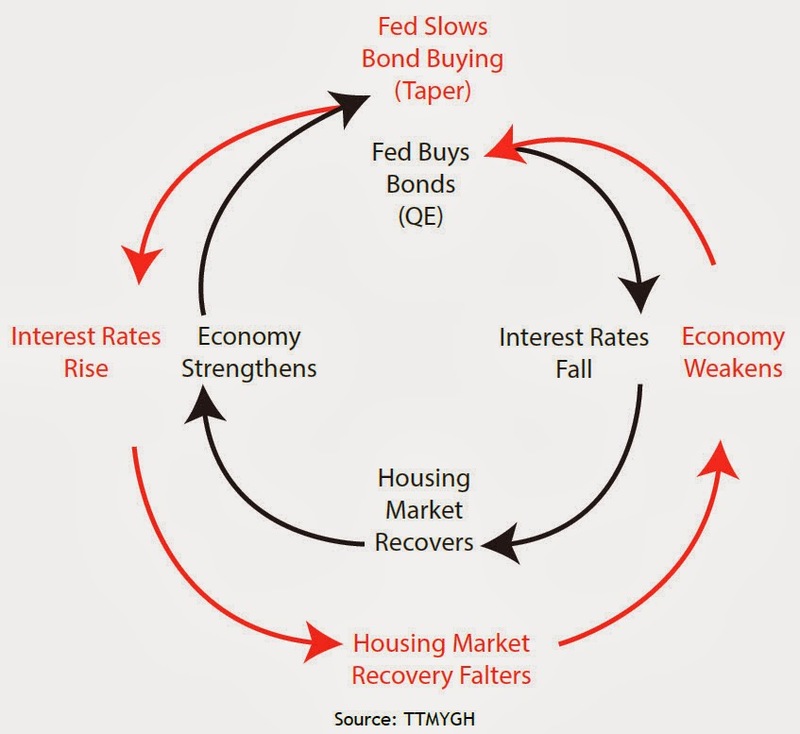 Low interest rates forever. Since the taper was mentioned in May of this year the 10 year U.S. bond yield rose from 1.7% to 3% before backing off to 2.6% where it is today. The 10 year yield is the benchmark for how mortgage rates are determined (10 year yield + investor spread = mortgage rates). 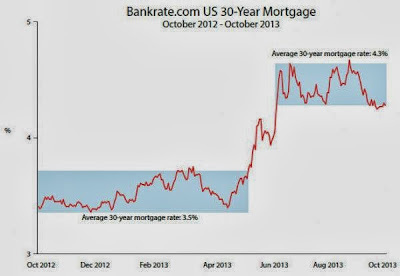 The following chart shows that mortgage rates hovered at a record low trend line for a long period before rising substantially and "resetting" at the new higher level. What has this done to the housing market? Affordability has now fallen to a five year low. Higher interest rates + higher home prices = lower affordability (due to higher monthly payments). The stock market has priced in U.S. home prices surging higher years into the future based on low interest rates forever. Subprime auto loans are back, creating an artificial floor under the automobile sales industry. The following shows the percentage of auto dealers reporting that financing is hard to get. The stock market has priced in a renaissance in auto sales trending out years into the future based on low interest rates forever. 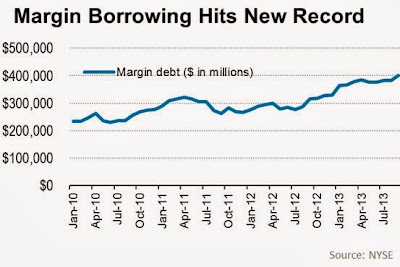 Margin borrowing (borrowing money to buy stocks) has hit a new all time record high. Sam Stovall, the chief equity strategist at S&P Capital IQ summed up this concerning growth perfectly; "If somebody is willing to borrow money to invest in stocks, they have a very high confidence level. And if everybody's optimistic, who's left to buy?" 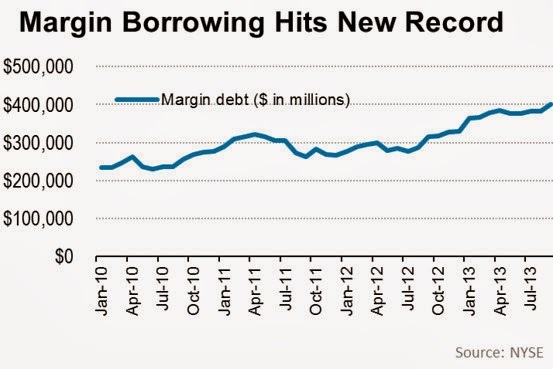 The stock market has priced this margin debt growth rising forever. 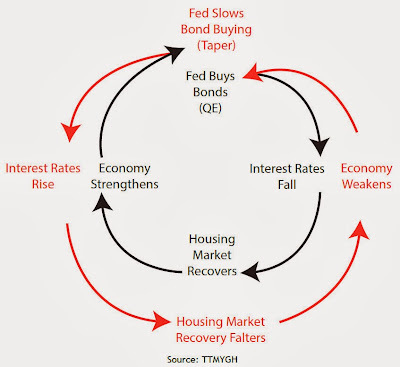 I use the Fed and the U.S. as an example but euphoria has spread like an virus outbreak around the world. In combination with the Fed, the Bank of England and the Bank of Japan are unleashing a relentless spray of QE-ternity liquidity into the markets. Money moves freely around the world in today's liquid markets and asset bubbles are appearing everywhere. U.K. real estate prices are now rising 10% a month while real estate in China is now rising at 12% a week based on the most recent sales data. Stock markets in Europe are surging as bond yields continue to fall in bankrupt nations. Just the promise of unlimited money printing from the European Central Bank has sent the entire region into a delusional frenzy. What has been lost during this unbelievable global asset price surge is actual growth in the economies these asset prices are located in (as Faber discusses below). The world is approaching stall speed. Jobs have not appeared during this asset price resurgence. The wealthy see their portfolio values rise by the hour as the "rest" run on a treadmill that is breaking down. Central banks around the world have found themselves in the perfect sweet spot. We are currently in the eye of the storm and historians will look back and wonder how so many could be blindly fooled by a wave of printed money and an ocean of toxic debt. More from Marc Faber this morning, one of the most successful investors of our time. "We are in a giant asset bubble around the world." please define the 'safest forms of cash'. In order of safety: Physical cash, U.S. t-bills, swiss money market claims, FDIC insured cash in bank. Any opinion on the AU housing market? It seems like a bubble by all indicators but it’s going on for a loooong time. Longer than it should be. Perhaps fueled by commodity prices.